Finding any fault with The Americans almost seems un-American. This is particularly true in light of the continued snubs of this first-rate FX drama series by voting bodies for the Emmys, the Golden Globes and the Screen Actors Guild awards. But even if it makes me seem a bit like a Commie pinko. I’m a little underwhelmed by the first four episodes of Season 3, which launches on Wednesday, Jan. 28th at 9 p.m. (central). Not devastated but somewhat deflated. The great starts to Seasons 1 and 2 have a way of working against the early stages of Season 3. Even though Wednesday’s premiere is marked by an early slam-bang action sequence involving Keri Russell’s Elizabeth Jennings. 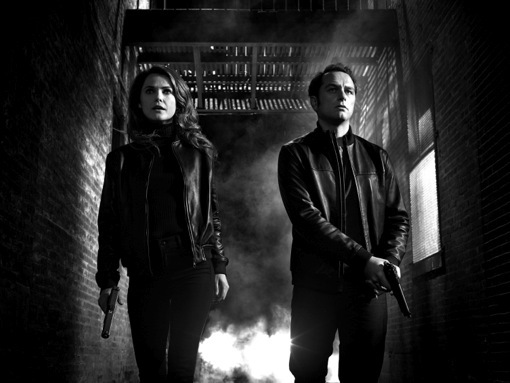 Elizabeth and her fellow undercover Soviet spy husband, Philip Jennings (Matthew Rhys), were left with a Solomon’s choice at the close of Season 2. Their 14-year-old daughter, Paige (Holly Taylor), who lately is embracing Christianity, is fully expected to join the “family business” as part of the “Second Generation Illegals” program. And they’re told there’s no time like the present to start “grooming” her toward an awareness of who her parents really are. In what will be a season-long thread, Philip is very much opposed to turning his only daughter while Elizabeth sees this as duty calling. That makes for quite a divide-and-conquer story line, but the first four episodes move pretty slowly on this front. Instead, much time is devoted to the somewhat murky business of infiltrating the CIA’s “Afghan Group” during a period when the Soviet invasion of Afghanistan is in peril of blowing up. “Reagan wants to turn Afghanistan into our Vietnam,” says ex-KGB handler Gabriel (Season 3 newcomer Frank Langella), who comes out of retirement to oversee Philip and Elizabeth in place of Claudia (Margo Martindale). The end of Season 2 also saw the removal of beauteous KGB agent/informant Nina Sergeevna (Annet Mahendru) after her lover and protector, FBI agent Stan Beeman (Noah Emmerich), reluctantly gave her up. Nina is now imprisoned in Moscow, facing charges of treason. The Americans’ efforts to keep her in the mix from afar are reminiscent of the storytelling dilemma faced by Showtime’s Season 3 of Homeland) after Nicholas Brody (Damian Lewis) escaped abroad and found himself imprisoned. I’m not sure that The Americans handles things much better during Season 3’s early going. Another of this season’s new characters, a defector named Zinaida (Svetlana Efremova), arrives in a wooden crate for the purposes of publicly denouncing the Soviet Union’s invasion of Afghanistan. But agent Beeman, assigned to shepherd her, isn’t entirely certain of her motives. On the side, he’s also attending EST classes in hopes of somehow mending fences with his estranged wife, Sandra (Susan Misner). This particular story line seems both forced and far-fetched. The Jennings’ son, Henry (Keidrich Sellati), is all but written out of these first four episodes. And one recurring character entirely reaches the end of the road before the remains are compacted in cringe-inducing fashion near the outset of Episode 2. While battling his wife over Paige’s fate, an increasingly vexed Philip is presented with a new option by second wife Martha Hanson (Alison Wright). He also must decide whether to follow through on another possibly sexual liaison, this time with an under-age babysitter who’s in position to provide some key information on the CIA’s select Afghan Group. It can be a little pokey at times, let alone confusing for those viewers trying to join The Americans in progress rather than first digesting the first two stellar seasons. Another narrow escape for Elizabeth also is thrown in -- as if to placate some possibly restive viewers. The Americans remains one of television’s very best drama series. Still, this season so far is not up to the fly-high level of the first two. Nine more episodes remain, though, which is ample time to steer a firmer, surer course. The thrills aren’t gone. They’ve just been a little sedated for starters.